Maha Krishnaswami was am inmate of Sri Ramansramam between 1938 and 1940. This book records the guidance given by Ramana to the seekers over these years including the more intimate once after dinner. The record is in English, having an easy flow and throwing clear light on the path. The coverage includes a period from April 1939 and most of 1940. 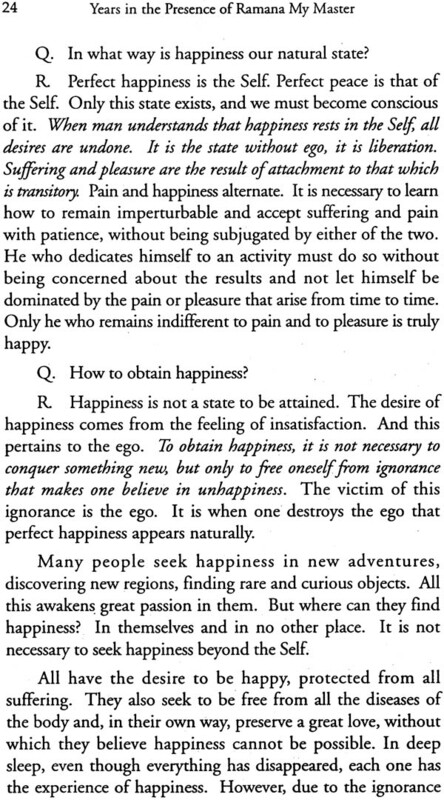 It is therefore an inestimable addition for all on the direct path of Ramana. Each conversation begins with a summary which shows the insight of the author. For me, it has been a great blessing of my Master Ramana in being given the privilege of editing this book, which was earlier published in Brazil. Bhagavan Sri Ramana is recognized as a Great Master by all who have had contact with him directly or through his teachings. There are no disagreements about his authenticity The benevolence that emanates from his face touches every one. However, such sweetness contrasts with his incisive manner of teaching: there is no middle term, there is no way to deviate from the direct path. The teachings of Sri Ramana were transmitted daily in the Ashram where he lived, and were noted by many people. Later these teachings were collected and divulged in the form of dialogues. In the work Ramana My Master the teachings are being presented in a new manner: they were grouped into chapters, each one pertaining to a central theme. The dialogues were maintained, however they are developed in a real situation, permeated with life, profound, universal and, at the same time, shaded by the local colour of the Ashram. The author, Sri Maha Krishna who lived for some years in the Ashram, recreates in 1ing colours the scenario where one of the most beautiful spectacles of all times took place, so majestic and so simple: the wisdom, incarnated in human form, transmitting the most profound teachings, in a simple and natural manner. 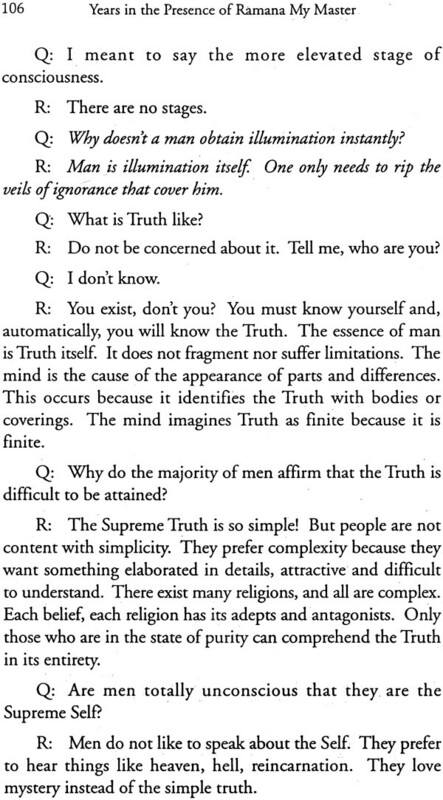 We are guided to the place and feel, at first, spectators of the action, but the words of the Sat Guru irresistibly involve us, and we go from spectators to participants; it is to each one of us that the Master speaks; it is our comprehension that is awakened; it is our sensibility that is touched; it is our logical understanding, Occidentalized, that he defies and, more than this, transforms into nothing, even before we can formulate an argument to contest it. And how could we contest it? 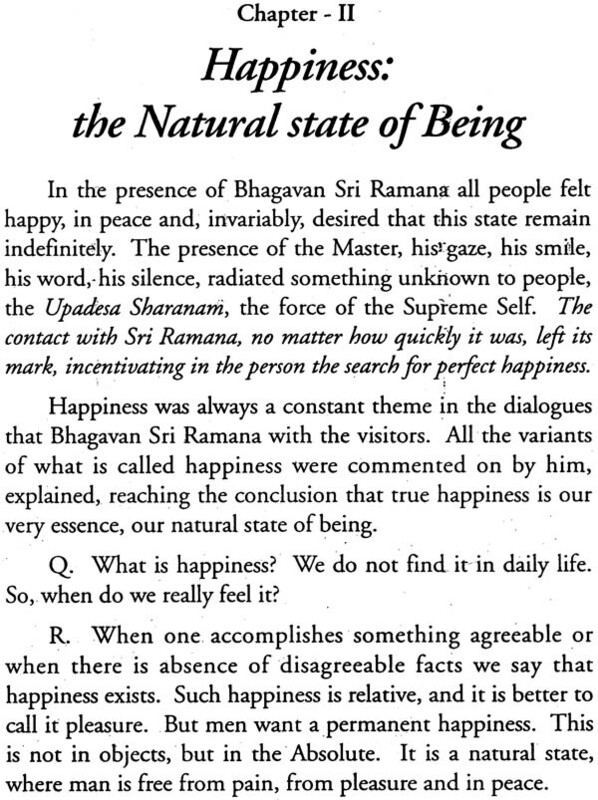 The wisdom of Sri Ramana cannot be argued upon, for it is the expression of life, the truth of being. His wisdom is not tied to words; it touches the essence of each one: it is the force of silence, the Upadesa Sharanam, that radiates from Bhagavan Sri Ramana to every one and impregnates each person who opens himself to these teachings. Ramana My Master becomes a work directed to each one, in particular. ‘When we say “My Master”, we forget that it is Sri Maha Krishna Swami who says so. Ramana is the Master of each one of us. We can only agree with the author: Ramana is my Master. We are sweetly cradled by the teachings that are, each one of them, complete, perfect. We have the impression that there is nothing else to say, that nothing else can be added. It is then that Sri Maha Krishna Swami intervenes, leading us the multiple faces of the fundamental teaching of Sri Ramana: “We are the Self”. Ramana, at the same time that he annihilates the values so dear to men, rooting out the ego, removing their bases of support, he is also the balm and the consolation for this same pain. 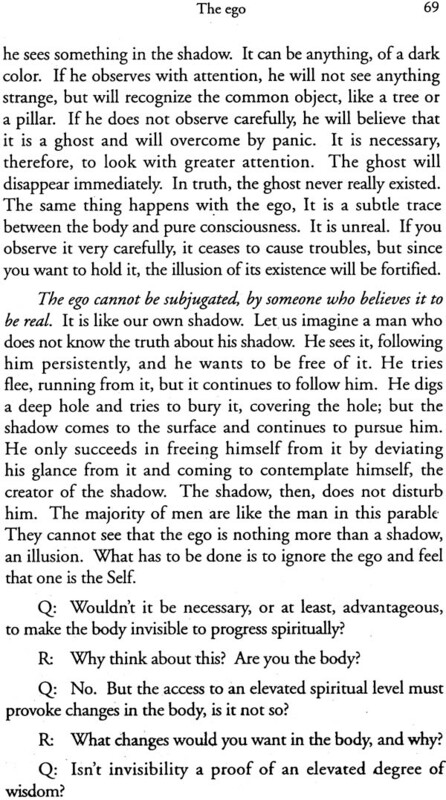 In fact, it is not even pain, because he shows that even pain itself is unreal, but merely an illusion. Men have placed over their true essence various masks, and these have adhered to their flesh. Their removal dilacerates their faces: such pain is unbearable for them and they prefer to remain bound to the mask. Sri Ramana also removes the pain — which is, equally, a mask. To be absolute, integral, real, so simply to be natural. Man is like a bird with powerful wings, destined to fly free, but who believes he is a reptile restricted to the ground. Bhagavan Sri Ramana undoes this illusion, and makes us soar in majestic flight, where our vision becomes cast, and we can contemplate the unity leaving forever the illusion of a dual world, where we crawl in the dust of pretty and false values. We contemplate the unity free, conscious of our own nature. To fly is not painful. Nor is soaring in flight painful; and neither is molting the false reptile skin. In this book we do not only have Master Ramana to admire, but also the living experience of he who lived with him, who vivified in himself the teachings and is, for this, capable of transmitting it in a way. which touches us profoundly. Sri Ramana is no longer only an admirable Master of India, who moved all those who went to Arunachala, with his peerless presence: he becomes alive, dynamic, contemporary He leaped from the paintings that adorned the altars of temples in to our existence. He was brought by his own will, which is the will of the Supreme Self, for Ramana and the Self are the same and indissoluble unity. He ordered Sri Maha Krishna Swamy established himself in Brazil, the land indicated by the Sat Guru as the place where the sacred teachings of all the Great Masters would be kept and — better than being kept — would be vivified, made accessible to all who wanted to reach them, to all who would be disposed to free themselves from the illusory and dense veils entangled by false knowledge and dive in to the ocean of peace, in the same peace that constantly radiates from Sri Ramana. These are not sensationalist words. To prove this fact, one needs only to let Sri Ramana impregnate each fibre of its spiritual heart, and all the weight of the modern world, that people feel to be so chaotic, ceases to disturb. Sri Ramana teaches us to live, because life is something that we have forgotten, by being so involved with survival. Why Brazil? Why not Brazil? There are no justifications, there are no arguments. There is only the Truth to be felt: it is here, it is in Brazil, that there is the fullness of the force of Blessed Bhagavan Sri Ramana, brought through his disciple Sri Maha Krishna Swami. Maha Krishna Swami had spent three years from 1938 to 1940 as an inmate of Sri Ramanasramam. At that time, the inmates had a special opportunity of participating in post dinner talks with Ramana, which were in an atmosphere where they could experience more directly His grace, while seeking guidance on the path. Those years were of course an inestimable blessing for him and the readers of this book as well. Therefore the years which he spent at the ashram were most nourishing spiritually for him and through him to us. From the style of communication, it is obvious that he had not only imbibed every nuance of the teachings, but has the capacity to communicate it with direct simplicity. Though he was only perhaps in his early twenties, it is apparent that he had the spiritual maturity to grasp the essence of the inestimable benediction of being in the physical presence of Ramana glowing with the immensity of Self-Knowledge. This enables one to literally switch back in time and to become an inmate of the Ashram of those years and relive intimately the varied situations, which provide opportunity for a seeker to learn and in particular the significance of implicit obedience to the divine will. The master’s mood was like the flow of water, never the same, serious when required, full of infectious laughter; each word nay each gesture, would communicate a world of meaning and find a response, and awaken one to the divine sporting in the heart. In his post dinner intimate talks, Ramana would humorously refer to devotees conveniently satisfying themselves that they were obeying the guru’s words even though they had already decided on a course of action but appear to keep it pending for Bhagavan’s approval. Ramana would remark that some would forget the very purpose of what had brought them to the Ashram. Such thoughts as ‘I am serving the master’, c0fle•ctg• the proof’, ‘attending to the correspondence’, washing his clothes and so on are obstructive. For I would be at the centre of their actions negating Self-consciousness. One has to be grateful for the opportunity using it as a spring board to destroy the ‘thinking mind’ and be aware of Ramana’s grace, that very grace, which had brought them to his feet. Krishna Swami states, “The teachings of Sri Ramana were transmitted with the naturalness of truth of all that is. They were natural and true as the Sun, as the growth of trees, as the flow of rivers. I received them in a manner equally natural and true. I led them grow and bear fruit”. What does this book have to offer to those on the direct path, to you and me? It is a restoration of a lost treasure, the dialogues which Ramana had between 1938 and 1940 not available so far except for the inmates of Bhagavan Sri Ramanasramam, Brazil. Krishna Swami had gone and established an Ashram in the firm and certain belief that this was the direction given to him by his guru and master Ramana. 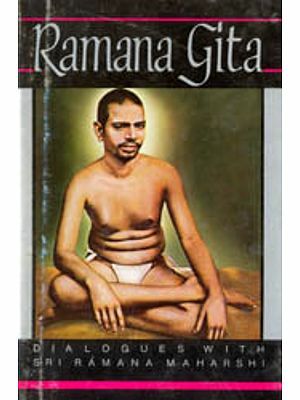 The entire gamut of Ramana’s guidance has been covered under fourteen different headings, Happiness, the Art of dissipating illusion, Karma, Mental powers, The World Scholarship, The Ego, The Oppressive mind, Apparent death, Renunciation, The Self – we are, Only the master can lead to Self-Consciousness, Initiative meditation, Consciousness of the absolute truth. One finds that in recording the dialogue, the author has been able to put himself in the shoes of others on the path and their need for clarifications on it. Its need to be highlighted that the dialogue cover a part of the period in which there is a gap between the ‘Talks’ and ‘Day to Day’. The ‘Talks’ entered in March 1939 and ‘Day by Day’ began in March 1945. It covers the period between April 1939 and most of 1940 and included the earliest period as well. Maha Krishna Swami is an unknown author for Ramana readers. This is because sometime after 1940 he had, as mentioned earlier migrated to Brazil. 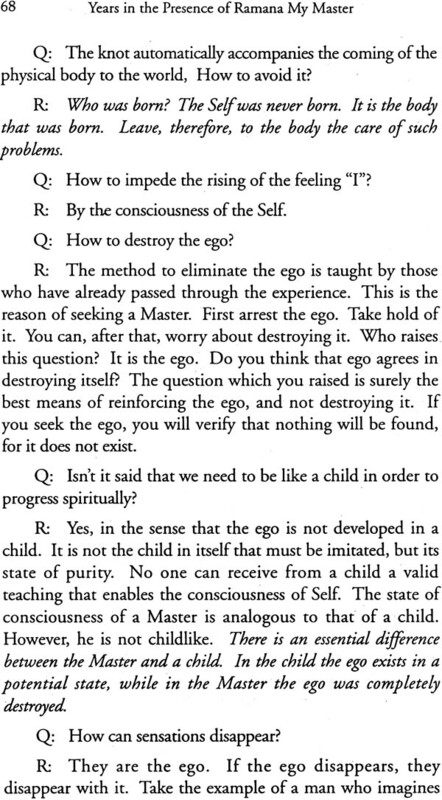 It is evident from the ‘Introduction’ to this book by Gopi Devi, a disciple of his in the task assigned to him by his guru and master Ramana. In the vastness of Ramana’s grace, many opportunities have been provided to me for editing publications on His life and teachings. It seems to me that this book is in many ways a very special one indeed. For one thing this great work has been resurrected as it were for the immense benefit of the disciple and devotees. Chronologically, where is 1940 and where is 2006; 66 years gap. A fresh discovery and what a treasure.